Depending on how complicated it is to gain access to your oil drain and filter; you could potentially save yourself hundreds of dollars in labor fees alone. Many times you can also save money on buying oil by the case and filters in bulk from your preferred supplier. If you don’t mind getting your hands a little dirty, then this is a great way to save some money and have a good excuse to spend more time with your plane! Once you have all your tools and materials gathered together in a spot where you can work, before you start taking the aircraft apart, I would recommend that you go fly your aircraft around the pattern a couple of times. 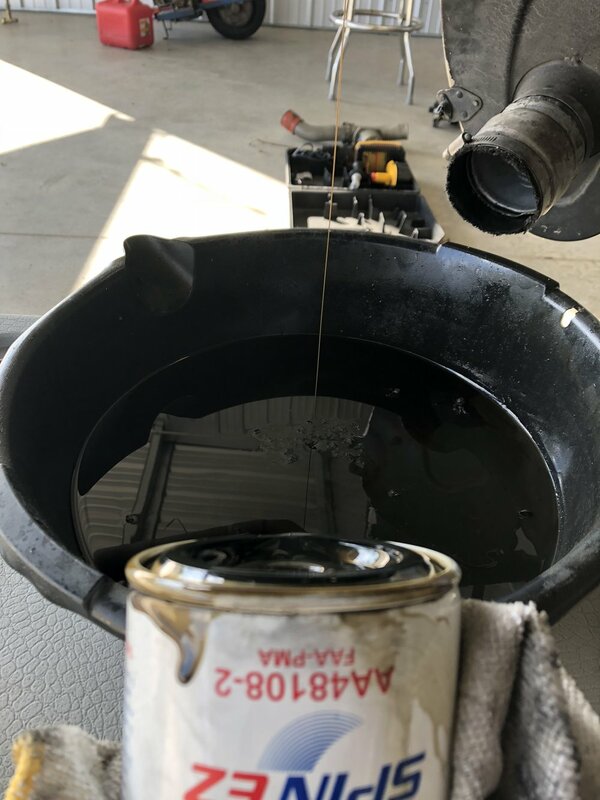 Not only will this heat the oil up (making it easier to drain from the engine), it will also help get the solid contaminants suspended in the oil, rather than collecting on the bottom of the oil pan. Besides, who doesn’t like to have another excuse to go flying?! Once back on the ground, you can start by removing any cowling necessary to gain access to your oil drain plug, as well as your filter. Some aircraft may require very few cowls or panels removed, but some may require several. I’ve heard of aircraft where shops will charge a minimum of three hours just to remove and replace the cowling! If your shop’s labor rate is $100 per hour, you’re money ahead already! Now that you have access to the drain plug, move your container underneath it in order to catch the old oil. Using your wire cutters, cut away any safety wire that is holding the drain plug in place. Before removing it completely, study how the safety wire was so that you can replicate it later. After removing the safety wire, use your wrench (or ratchet/socket) to loosen the drain plug. Be ready to catch the oil as it comes gushing out when gravity starts to take over. Depending on how much oil is in your sump and how warm your engine is, it can take several minutes for the oil to drain into your container. Don’t be in a rush here. Allow it to all drain out before proceeding. If you like to send your oil off for analysis, this is the point where you would “catch” the sample. Now I’m not going to lie, changing your own oil can become a very messy proposition. I’ve been doing it for many years now, and I still expect to spill just a little bit here and there. Just be prepared for this. It doesn’t hurt to have a little kitty litter handy to absorb & clean up little spills because I promise you they will happen. For most aircraft, it’s very obvious that the engineers who designed them were not the ones planning on working on them later on with as difficult as it can be to get to certain areas of the engine compartment. Once the oil has completely drained from the sump, you are ready to replace the drain plug. Be sure you remove the old crush washer and replace it with a new one. The whole reason behind having a crush washer there is that the soft metal compresses & conforms to the shape of your plug. Once “crushed”, it offers a better seal for the plug over that of just a conventional washer. You can check your service manual for the torque specifications when tightening down the drain plug; however, some mechanics out there will tell you that when the washer is appropriately crushed that the plug is tight enough. Once this has been accomplished, you can safety wire the plug in place so that it is unable to loosen back up. Let me stop right here and say that I am by no means an expert in the art of safety wiring. Sometimes it takes me three or four tries just to get it how it needs to be. I do find taking photos of things before I take them apart to be very helpful. I strongly recommend talking to your A&P or another local mechanic, and asking them for a little tutorial on how to properly safety wire items on your aircraft since it is a very important part of doing the job correctly and safely. Once you’ve properly safety wired the drain plug back in place, it’s time to repeat the last several steps with your oil filter. Snip, loosen, drain, replace, torque, and safety wire. 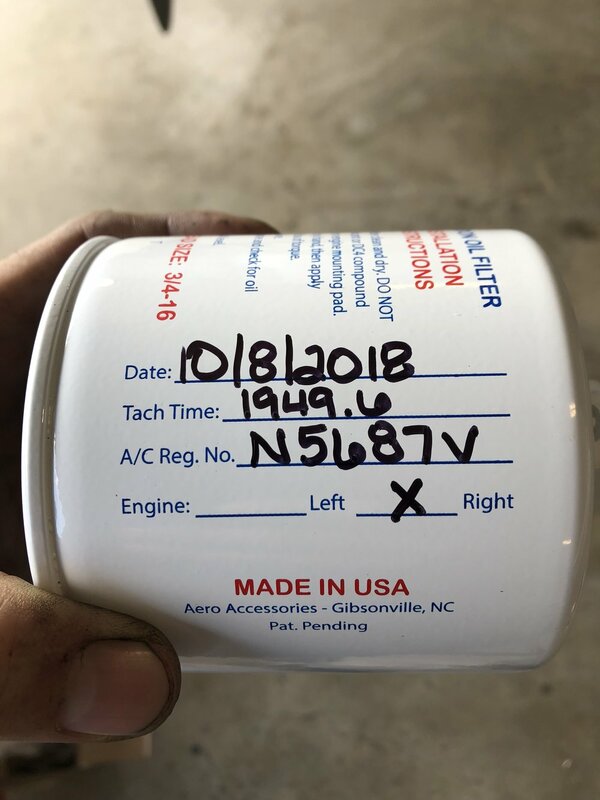 Most oil filters will have a place where you can fill information in specific to your aircraft including the tach time that the oil was replaced. This makes it easier for you to visually check later on and know when it’s time to change it again. Depending on your aircraft type, most manufacturers recommend you change your oil every 25 or 50 hours. Be sure to consult your manual for the correct information for your own aircraft. Also, do not just dispose of your oil filter right off the bat. You can cut the filter out of its casing to inspect for metallic particles. If you find some, that might be time for a conversation with your mechanic. After the oil filter is back on and safety wired into place, it’s time to add oil back into your engine. I know this seems obvious, but do not forget this step! I cannot stress this enough. I once saw a Cherokee come out of annual with no oil in the engine which could’ve been a real disaster had the person doing the post inspection check not caught it. Once again, refer to your manual to determine the appropriate oil type and quantity to put in your engine. Okay, we’ve drained and replaced everything, so it must be time to put the cowling back together, right? Wrong. If possible, you should try to run your engine prior to putting the cowling and panels back on so that you can check for any leaking. Once you’ve determined that all is good, then you can proceed putting everything back where it should be. We’re coming down the backstretch now with this operation. Just a couple of items left and then you can stand back and admire your work. First of all, find a suitable place to dispose of your old oil. If there is a maintenance shop on your airport, chances are there is a place to dispose of oil for later collection. If there isn’t a shop, check with the airport operator or with a local auto parts store in town. Don’t just toss it in the garbage bin and make it someone else’s problem. Completed oil change using 10 quarts of Phillips 20W-50 and new Tempest AA48103-2 oil filter. Engine test-run and no leaks noted. Remember, doing preventative maintenance allowed by the FAA is not just good for your wallet, but also allows you to become more familiar with what is going on with your aircraft. In turn, this allows you to communicate better with your mechanic when diagnosing potential issues later on down the road. Don’t be afraid to get involved with the maintenance of your own aircraft, but don’t forget to get a proper tutorial ahead of time as well. Get out there and give it a shot!